This week's blog post is written by Illinois State University graduate student and dietetic intern, Samantha Concha! You may be aware of the current vegan craze that has been circulating around social media and probably some of your favorite weekly magazines and newspapers. But are you still a little confused of what defines someone as a "vegan?" In short, veganism can be defined as a diet excluding all forms of animals and animal by-products. Sound a little familiar? If you are contemplating whether this is vegetarianism in itself, then you are correct. If it makes it easier to mentally digest, veganism can be seen as an extreme form of vegetarianism where both dairy products and eggs are excluded from the diet. Preheat oven to 400°F. 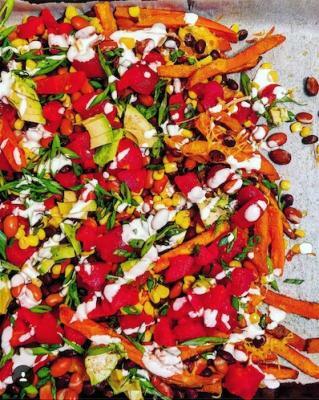 Prepare a baking sheet with parchment paper and evenly lay out frozen/fresh sweet potato fries. Drizzle olive oil, salt and pepper over fries and combine well. Bake for 15 minutes. The fries should be sizzling, but not caramelizing quite yet. Top fries with rinsed beans and sweet corn. Reduce heat to 250°F and bake for another 15-20 minutes. Finish by topping fries with diced tomatoes, chopped green onion, pieces of avocado and favorite vegan cheese.